Kitchen granite countertops in tiles or slabs provide a unique and long-term home remodeling solution. This remains one of the toughest, most sophisticated natural stone choices on the market. Best of all, no two slabs are alike – you will therefore be creating a unique-looking, luxurious kitchen. You can also be sure that with good care, the splendid looks of your granite kitchen countertops will not fade over time. What are the main benefits of this product and why is it so popular? It is a given that kitchen granite countertops will add to the value of your property. This makes it a sound investment. It adds such elegance to a kitchen, that it will more than pay for itself by the time you erect that For Sale sign outside. If you have funds from a home improvement loan available, this may be a sensible way to spend it. Granite is a natural material that is freely available. It has been around for centuries, yet the trend towards home use has only taken hold in the last forty years or so. While it may seem expensive compared to other options, it can be one of the best investments a homeowner can make. If you take the durability into account, this truly becomes one of the more affordable home improvement options. It is a practical and attractive solution for kitchen cabinets. An amazing array of colors is available. This is in part due to the fact that the material is quarried from all over the world. Each area’s stone has its unique qualities. Shading varies from light to all the rich, warm and deep tones. The kitchen granite countertops can be coordinated with almost any sink finish and accessory type, from ceramic to copper and stainless steel. This is not simply a new fad. It has been around for ages and has a solid track record, so to speak. Due to its texture, this is one of the most sanitary materials for a kitchen. As it isn’t porous, it won’t be prone to harboring bacteria and other kitchen no-no’s. Mold and mildew won’t get a grip here. Of course, if you make use of granite tiles, you will still have grout lines that are prone to mildew problems and staining. Maintenance is fairly simple, provided you use some common sense. Daily cleaning will involve little more than a quick wipe with a soft cloth or some paper towels. Use ordinary soapy water. Due to the dense grain the stone isn’t very porous and staining therefore isn’t a major problem. Once it has been sealed or polished, it is resistant to moisture. The sealing needs to be repeated every 1 to 3 years. Learn to clean as you go along. It is just so much simpler and safer to wipe a mess immediately. In almost all respects this is an option that is fine with kids in the home. There is very little that they can do that will damage your counters. Perhaps you should just ask them not to hang from the more vulnerable edges, as this may cause a problem in the long run. This stone has another feature that makes it popular. If you do have an area that is damaged, it can be repaired. Just don’t attempt this yourself. Speak to your supplier, describing the flaw, and get expert advice. The hard surface can’t be scratched, except by more granite or diamonds. This is where its practicality for kitchen use comes in. You can’t afford to tip-toe around cabinets and work stations. 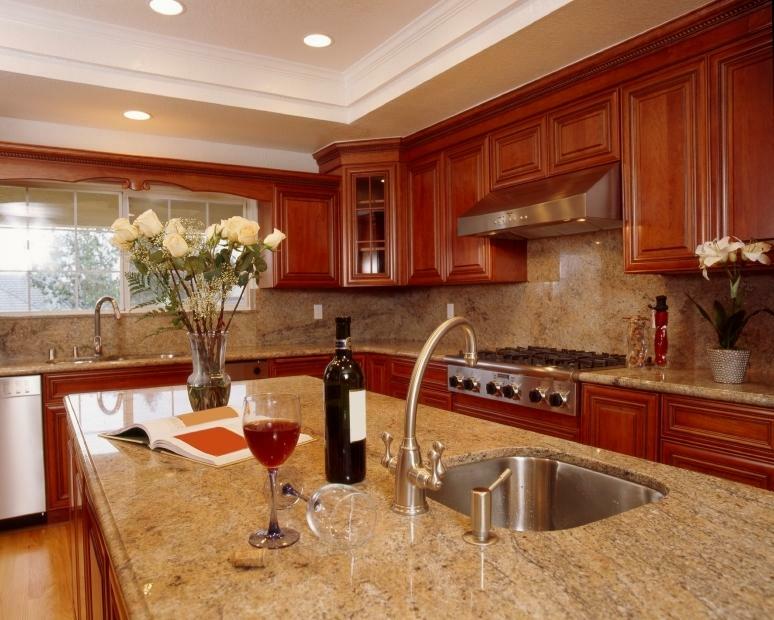 You need to be able to do your job without fear of damaging the kitchen granite countertops. Granite gives you this reassurance. The fact that it won’t become scratched is one of the main reasons why it retains its shiny appearance for so many years. These surfaces cope admirably with temperature changes and won’t blister or crack. They can even resist frying pan heat. No hot griddle will leave a reminder on your new countertops. Even so, it is advisable to still use pads or trivets when working with hot items. Cooks love working on granite kitchen countertops. You can even cut on them without damaging the surface. And you will be amazed by how well your dough suddenly turns out. The cold surface is perfect for handling pastry.